Those who were alive in the 1970’s and 1980’s had always wished for braces that were nearly invisible to the naked eye and yet achieved the same effects as metal braces. This dream is now a reality thanks to what are known as invisible braces. There are several advantages with this option as well as a few concerns to address before making a final decision. This article will take a quick look at a handful of the most important aspects of this revolutionary treatment method. In many ways, this design is not actually “braces” in the traditional context. Gone are the metallic brackets and wires that were attached to each tooth. These have been replaced with a hard plastic composite that is moulded in the shape of one’s teeth (both upper and lower trays are available). Through complex techniques such as three-dimensional imaging, dentists will take a “picture” of your teeth. This will then be formed into the mould. Over time, the shape of this mould is adjusted. 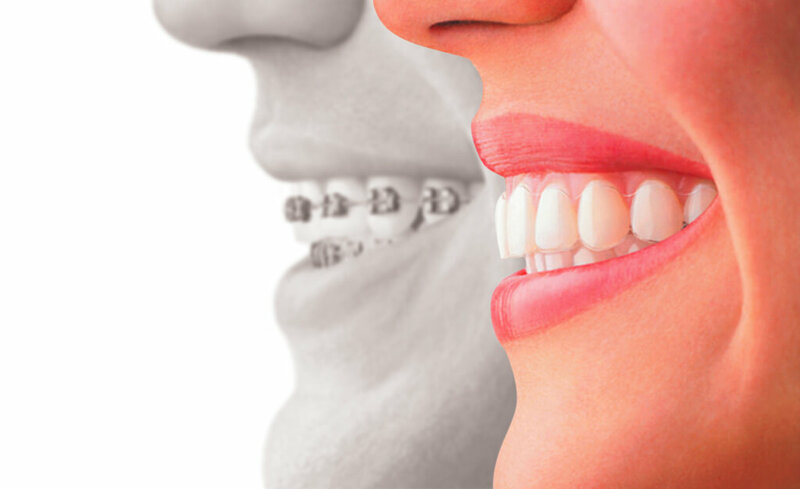 Much in the same way as traditional braces, the end result will be straighter teeth with each successive adjustment. There are several reasons why this type of treatment should be considered. First, the moulds can be completely removed. This dramatically aids in the cleaning process and there are much less chances that plaque will accumulate. The fitting procedure is absolutely painless and there are no obtrusive brackets to rub against your cheeks and gums. As their name hints, clear braces are virtually invisible to the naked eye. This is a great advantage to those who may be conscious in regards to orthodontic work. The main factor that prohibits some from choosing invisible braces involves their cost (although prices have been substantially reduced in recent times). As opposed to normal braces, these invisible fixtures can only treat rather minor dental issues. More severe conditions such as a pronounced overbite or noticeably crooked could still require metallic braces. For more stubborn issues, it may be necessary to treat your teeth with metal braces even after the invisible variety is removed. Design times can be lengthy and finally, some users will notice that they develop a slight lisp at first (this is almost always corrected naturally within a few days to a few weeks). The first step will naturally involve a trip to the dentist or orthodontist. He or she can examine your teeth to determine if these invisible moulds are a possibility. Their cost is a second issue to address. Are there payment plans available? How long will the entire procedure take and will you need metallic braces installed after the initial process is completed? If you have desired a non-invasive treatment to correct your teeth, this type of braces could be the best choice possible. Keeping the previously mentioned factors in mind will provide you with the insight needed to make the best decision possible.